Today's world demands more from us and we demand more from our bodies and ourselves. Get more from your precious time and truly take care of yourself with a Therapeutic Massage. As a related service to the mental aspects of Effectiveness Coaching, Christina offers Therapeutic Massage to bring about physical metamorphosis. Human touch has been used since the beginning of humankind to ease pain and suffering and to promote healing. Therapeutic Massage is the systematic manipulation of the soft tissues and energy of the body to provide tangible benefits. Christina is able to soothe away some of the physical manifestations and injuries caused by todays stress. Therapeutic Massage heals more than the physical body. It also provides support to the emotional, mental, energetic and spiritual aspects of your being. 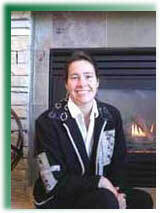 Christina is a Nationally Certified Therapist in Massage and Bodywork (NCTMB). Her massage therapy practice is located in the Southeast Metro area of Denver, Colorado. She also takes her massage on the road, offering house-calls, and office visits, in addition to sessions in her SE Denver location. Christina has experienced sports injuries, and lived through chronic pain due to postural anomalies. She knows first-hand how Massage Therapy makes a difference. With her extensive training, she is able to offer clients sensitive, nurturing, therapeutic touch, and is prepared to work with people who have experienced injury due to sports, repetitive stress, car accidents*, and more. She enjoys working with a wide variety of clients, including people who are athletic (professional athletes), stressed from business, and people that just need an hour (or more) for quiet introspection and relaxation. Learn about how to get started, get session information, and learn policies. A system of strokes, kneading and friction techniques on specific muscles and connective tissue, combined with active and passive movements of the joints for relaxation or therapy. Hot Stone Therapy incorporates heated, smooth stones into a Therapeutic Massage. Hot Stone Therapy has all the same benefits as traditional (swedish) massage, and then some!!! All Things Connected provides Massage Therapists that come to your business location with a massage chair for short sessions focusing on the back, neck, shoulders, and arms. Enhance your events, such as weddings, sporting events, conventions or trade shows with Thereapuetic Chair or Swedish massage. We can handle events of any size. Massages are non-sexual. If you want that service please go elsewhere.